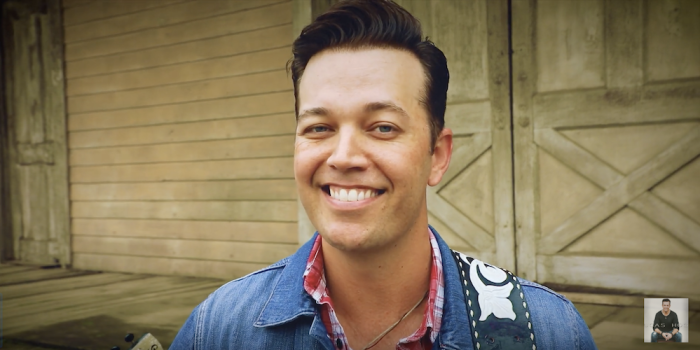 Billboard-topping country music singer Lucas Hoge says his new single “John Wayne and Jesus” is a tribute to his childhood and the values that were instilled in him. Hoge filmed the video for his new single during a recent trip to Los Angeles where he performed on Hallmark's daytime talk show “Home & Family.” The single was also shot at the same Warner Bros. lot where Academy Award-winning legend John Wayne shot many of his movies. "'John Wayne and Jesus' was a thought I had been sitting on for a while. When I got together with my buddies Andy Wills and Danny Simpson I knew they would be the perfect guys to bring it to life. We wanted to create one of those songs that really encompassed the way of life we had as kids and the values that mom, dad, John Wayne, and Jesus gave to us,” Hoge told The Christian Post of his new song. “John Wayne and Jesus” is being released as a featured track and is not on an album at this time. “I had mom and dad, John Wayne and Jesus/everything that a little boy needed / living my life walking that line between us / I learned to fight and I learn to pray / I learned right from wrong along the way / and til this day I practice what they're preaching / I had mom and dad, John Wayne and I had Jesus,” the song’s chorus states. Hoge’s third album Dirty South hit No. 1 on Billboard Country Album Sales Chart in 2017. He has a number of brand collaborations, including with Bass Pro Shops/Cabela’s, Luke Bryan, Justin Moore and he's now the country music ambassador for Southwest Airlines. Every Sunday, Hoge performs a gospel song on his Facebook page for his series "Sunday Sessions." Many of those sessions can be watched HERE.